"The New and the Old Clothes. 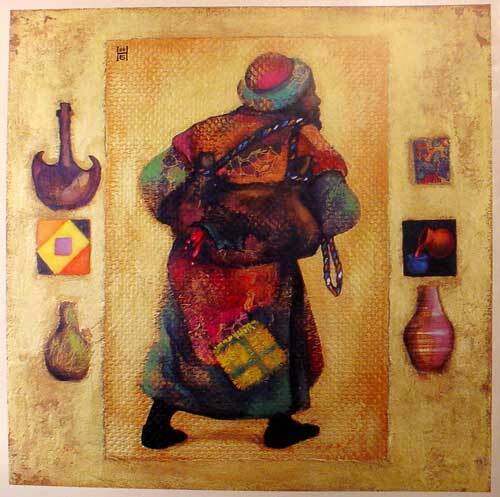 The New Wine and the Used Wineskins" by Kazakhstan Artist Nelly Bube. On this pericope Stoeckhardt, Fahling and Lenski are recommended. Ylvisaker and Hendriksen, for various reasons, are not recommended. Ylvisaker is usually very dependable but in this instance makes observations which, in the estimation of these Notes, are not Scriptural. They will be pointed out. The parallel accounts (Matthew 9:14-17; Luke 5 :33-39), as does Mark 2:18-22, follow immediately after the account of the call of Matthew Levi and his reception in honor of Jesus. The Pharisees and their scribes objected to what Jesus was doing: "Why do you eat and drink with the publicans and sinners?" Jesus answered: "They that are healthy have no need of a physician, but they that are sick. I came not to call the righteous but sinners." What irked the Pharisees was that Jesus associated in such a familiar fashion with repentant publicans and sinners. Commentators debate the question as to whether our text (and its parallels) has a direct connection with what precedes. Hendriksen is typical of those who reject a connection. This interpretation is reflected by TEV: "On one occasion the followers of John the Baptist and the Pharisees were fasting," and NEB: "Once, when John's disciples and the Pharisees were keeping a fast etc." But the words "once" and "on one occasion" are not found at Mark 2:18. It's simply "and." In fact, Matthew 9: 14 has "then" which indicates immediate succession. Jesus has answered the question put to the disciples by His obstinate adversaries. The reply has not broken their resistance. They advance a new charge couched in the form of a new question: Jesus is too untrammeled in His manner of living, and His influence breeds the same offensive conduct among the disciples. Fahling: Not only was the association of Jesus with publicans and sinners offensive to the pharisaic mind, but the feast itself seems to have been in conflict with current opinion and practice. Instead of a fast a feast. The feast of the converted Levi-Matthew in honor of Jesus probably took place on one of the two days appointed for weekly fast. In other words, the Pharisees objected not only to Jesus' eating with publicans and sinners but also objected to eating at all on a day designated by the Pharisees as a day of fasting. Mark 2:18 Now John's disciples and the Pharisees were fasting. Some people came and asked Jesus, "How is it that John's disciples and the disciples of the Pharisees are fasting, but yours are not?" "Were fasting" is periphrastic. KJV translates: "used to fast," customary action. NKJV has changed this to: "were fasting," which fits the above interpretation better than that of KJV. By the way, KJV and NKJV follow the Koine text by reading "the (disciples) of the Pharisees" not "the Pharisees," while the reading of Nestle Greek text is followed by all other translations. Furthermore, who is the subject of "came and asked?" RSV, NIV, JB and NEB assume that verse 18a is simply an observation and that the subject of the two verbs just mentioned are people other than the disciples of John and the Pharisees. They translate: "Some people came etc." In other words, some people who belonged neither to those mentioned in 18a nor to Christ and His disciples want an opinion as to who is right. KJV, NASB and NKJV simply have "they" as subject of the two verbs, implying that "they" means "the disciples of John and the Pharisees." AAT puts it well: "John's disciples and the Pharisees, who were fasting, came to Jesus etc." The question they put to Jesus indicates a fundamental difference in practice between the disciples of the Baptist and the Pharisees on the one hand, and that of Jesus' disciples on the other hand. "But" is clearly "but." The question implies that people considered the practice of both authoritative. And this difference in practice, as they surmised, denoted a fundamental difference in theology. Here we must digress for a moment and consider the matter of the Baptist's disciples. John 1 records the fact that five (or six) of the Baptist's disciples became Jesus' disciples and John's approval is implicit there. Next, John 3:25-30, is important here. Some of John's remaining disciples were jealous of and resented the fact that Jesus' disciples were baptizing more people than John's disciples. But John corrected their thinking: "He must increase but I must decrease." At John 4:1-3 we are informed that,lest the Pharisees would pit Jesus' baptism against John's baptism, Jesus left Judea and went to Galilee. Next, nowhere are we told that the Baptist taught his disciples to practice frequent fasting, like that of the Pharisees. It is true, as Hendriksen points out, that, according to Matthew 11: 18 and Luke 7:33, the Baptist, at least in a sense, was ascetic. But he was no Pharisee. This pharisaic practice was a part of John's rigorous ritual. He adopted the ascetic formularies of the day. His disciples, too, had espoused these rigid rules of conduct, and fasted the more during these days, because they mourned the melancholy fate of their master. The Baptist's stern call to repentance would naturally go together with fasting, although none of the evangelists has preserved to us the exact teaching of the Baptist on this point. All that we can gather is that he had allowed his disciples to continue the practice of fasting. . . John's disciples ask for enlightenment; the Pharisees want to discredit Jesus. Misunderstanding the austere manner of their master and imitating it in a false manner, a number of John's disciples had not followed his suggestion to leave him and follow Jesus, but had associated themselves with the Pharisees, who above all wanted to regulate the piety of Jesus by their own. Many of the disciples of John, who had despised the guidance of their master had refused to follow Jesus, inclined towards the ways of the Pharisees, emphasizing outward good works, going beyond the law, observing the traditions of the elders, fasted and prayed much, Luke 5;33, and were not interested in the grace of Christ. Only one day of fasting was divinely appointed for the entire year, the Day of Atonement, Leviticus 16:29; Numbers 29:7. But it appears that in the period of the Exile four annual fasts had sprung up, Zechariah 8:19; 7:1-12, which in the time of Jesus had increased to two a week, Luke 18:12. That Jesus did not forbid fasting is clear from Matthew 6:17 and 18. But He did condemn ostentatious fasting, Matthew 6:16. He did condemn the fasting, twice a week, by the Pharisees as rankest workrighteousness, Luke 18:12. That God condemned mere formal fasting, not connected with contrition and faith, is apparent already in the Old Testament. See Isaiah 58:6.7 and Zechariah 7:1-10. Lenski: Jesus does not treat fasting as a mechanical arrangement, merely to be practiced on fixed days. As such it is valueless. To fast or not to fast is determined by the conditions in which we find ourselves. It's the same old problem, under a different form, with which the Judaizers burdened the Galatians, namely that ceremonies (in this case circumcision) were necessary for salvation. Paul was not condemning circumcision as such but when the Judaizers attached righteousness to the ceremony, to use an expression from Luther, then it became detrimental. It becomes clear in verses 19-22 that Jesus justifies the practice of His disciples of not fasting and condemns the attitude underlying the frequent fasting of the disciples of John and those of the Pharisees. It is sad to note that some of the Baptist's disciples had aligned themselves with Pharisees against the disciples of Jesus. The root problem was self-righteousness, similar to that in the parable at Luke 18:9-14. Mark 2:19 Jesus answered, "How can the guests of the bridegroom fast while he is with them? They cannot, so long as they have him with them." By the use of an axiomatic question which requires a negative answer Jesus shows how foolish the frequent fasting of the disciples of the Baptist and of the Pharisees is: "The bridegroom 's friends cannot be desisting from eating while the bridegroom is with them, can they?" The implied answer is: "Of course not!" Jesus evidently used this illustration because the Baptist himself had used it. See John 3:29. There John said: "The friend of the groom, who stands and listens to his (the groom's) voice rejoices exceedingly because of the voice of the groom. And so this my joy is complete. He must increase but I must decrease." The point that John made was that he was happy and joyful at the presence of Christ, not jealous, sullen and unhappy. In His omniscience Jesus must have known what the Baptist told his disciples and therefore uses the very same illustration. The Baptist's disciples had been taught by their teacher and therefore knew better than did the Pharisees. Jesus answers His own question: "As long as they have the groom with them they cannot be desisting from eating." Jesus is not saying that eating is meritorious nor is He condemning fasting as such. But He is saying that fasting is a sign of sadness and contrition, completely out of keeping with joy and faith in the presence of the Redeemer. The Baptist himself was a fitting example of such joy. But the bridal day never dawned for him (the Baptist). He was taken away, and Jesus was taken, before the nuptial ceremony could be celebrated. His (Christ's) presence marks the marriage week. . . . Jesus is the Bridegroom. His disciples are the sons of the bridal feast, the best men at the wedding. How could they possibly be in sorrow with the bridegroom in their midst? We must stop with the relation here sketched and not bring in the bride or other essentials of a wedding. Jesus is pictured by this bridegroom. . . No one fasts at a wedding, to say nothing of the main participants. Edersheim points out that even according to rabbinic law, which the Pharisees knew, the marriage week was to be a time of unmixed festivity. During this week all mourning was to be suspended. Jesus is gently telling them that what they reject on the level of reason they are espousing on the level of true religion. Their true problem is their attitude toward Himself. Mark 2:20 "But the time will come when the bridegroom will be taken from them, and on that day they will fast." Here illustration wanders off into prediction. The word "taken away" is a violent one. It predicts Jesus' violent death. "Days will come when the bridegroom is violently taken away and then they will fast on that day." "On that day" amounts to "at that time." If a bridegroom would be removed violently, people would be sad. That should be obvious. Jesus is taking that obvious truth for granted. He is here limiting the word "bridegroom" to Himself. This verse reminds us of John 16:20 where Jesus says: "Verily verily I say unto you that you will weep and mourn but the world will rejoice. You will be pained but your pain will turn into joy." The point is the sorrow at the removal of Jesus. Nowhere are we told that after Jesus' death people were told to fast literally. Stoeckhardt: The disciples of Jesus will suffer much tribulation and persecution for the sake of their Master, enduring patiently the cross and shame of Christ. This is the kind of fasting that is pleasing to God. 'They shall fast' must not be interpreted as a reference to the legalistic fasting as in the Old Covenant, but as a spontaneous expression of a desire for the requirements of the spirit. The kind of fasting which Jesus wants is spontaneous fasting which is a sign of true contrition over sin. When the author of these Notes was a child, on days when the whole family would go to communion, his father did not eat prior to going to communion. But he would always say to us children: "When I was a child we practiced fasting before going to communion as a sign of contrition, not as a deed that made us better. If you prefer to eat, that is not wrong. You have committed no sin." It was wise of him to tell us that, for we were free to eat or not to eat. Mark 2:21 "No one sews a patch of unshrunk cloth on an old garment. If he does, the new piece will pull away from the old, making the tear worse." Now follow two axioms, universal truths, and added explanations to show what happens if the axioms are disregarded. According to the account in Luke, there was a third axiom. The translations are interesting. We give a literal translation: "Nobody sews a patch of new (unshrunk) cloth onto an old garment. If he does, the new patch will tear away some of the old cloth, and thus the hole will get worse (larger)." Jesus means that when the mended garment is washed, the new patch shrinks, tears parts from the old garment, thus making things worse. The point is utter incongruity. Jesus is not speaking about incongruity between the Old Covenant and the New Covenant. The old garment is the old legalism, with its rituals and ceremonies, the old molds in which, according to the ordinance of God, the religious life of Israel was stamped in the age of its minority. . . 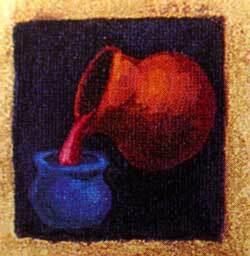 The New Covenant is not merely an improvement with new ceremonies and precepts. There are two distinct dispensations. The piety of the Pharisees and their worksrighteousness does not harmonize with the doctrine of Jesus and His teaching of the free grace of God, being unable to tolerate each other. He who trusts in his own works and wants to sew something of the Gospel on his own garment of righteousness, to cover an occasional mistake with the works and merits of Christ, will soon experience that there is no comfort in this, he still clings to His own works and merits, and will be lost with the comfort of his works. Jesus is not comparing the Old and New Testaments, but rather the worksrighteousness of men with the Gospel. 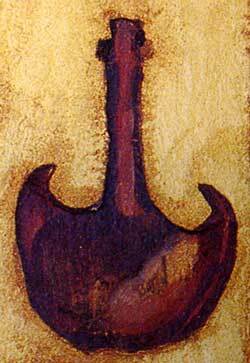 Mark 2:22 "And no one pours new wine into old wineskins. If he does, the wine will burst the skins, and both the wine and the wineskins will be ruined. No, he pours new wine into new wineskins." A second axiom. This axiom heightens the first. "Nobody puts new (unfermented) wine into ~tiff) wineskins. If he does, the wine will tear the skins and the wine is lost as well as the skins. Quite to the contrary, new wine (goes into) fresh (pliable) skins." Lenski: This second illustration completes the thought. The old cannot be kept by adding A LITTLE of the new; still less by combining with it ALL of the new. In this respect the thought is parallel. . . The old robe cannot be conserved by adding the new patch; the new wine cannot be conserved by pouring it into old wineskins. In this respect the illustrations are opposites. The second, however, ends in a climax -- both the new wine and the old wineskins are lost. A wineskin was a goatskin removed without slitting it; the openings at the feet and the tail are closed, leaving the neck as well as the mouth. . . When it is fresh, the skin stretches considerably, but when it is old, it becomes stiff and bursts under pressure. "New" in the sense of not existing before. "New wineskins" is new in the sense of "pliable" as opposed to "old." Stoeckhardt: The new wine is the sweet Gospel of the forgiveness of sins and of the grace of God, which cannot be placed into carnal, pharisaic hearts. If the Gospel is preached to the worksrighteous people, it only will be split. They cannot understand the Gospel, nor will they be improved by it, but rather grow worse and in their defiance will be lost in spite of the Gospel. The Gospel requires new believing hearts, which accept it and preserve it, and with it they themselves are preserved to eternal life. In the parallel passage Luke (5:39) reports that Jesus used a third illustration: "And no man having drunk old wine desires the new; for he says, The old is good." Stoeckhardt: He who is in love with his old self-righteous ways of fasting and praying, has difficulty to wean himself from it, and to cling to the Gospel, which offers to man salvation freely without works. Fahling: They found the old wine so good that they did not wish to taste any other and therefore disdained the new doctrine of salvation full and free in Christ Jesus. The Mosaic Law (both ceremonial and moral) was given under the Old Covenant to reveal sin and to lead to Christ. Galatians 3:19-24. The Ceremonial Law was fulfilled in and abrogated by Christ and His vicarious atonement. Colossians 2: 16.17. We constantly need the moral law to show us our sin. Romans 3:9-20. Christ has redeemed us from the curse brought by the Law. He was made a curse in our stead. Galatians 3:13. The forgiven sinner is required to follow the third use of the law, Galatians 5:13, to keep him from giving license to the flesh and, on the other hand, to do the will of God. This is a fruit of faith, not a cause of justification. The preaching and teaching of the Word, Baptism and the Lord's Supper, are not ceremonies, but means of grace whereby God comes to man. They are not optional. Ceremonies, such as forms of worship, the church calendar etc., are necessary not because they make us better but because we need order and decency in the church. In matters neither commanded nor forbidden by God we are allowed liberty. But they should never be used in such a manner as either to give or take offense. Cf. Galatians 3;6 where Paul says: "In Christ Jesus neither circumcision nor the lack thereof avails anything before God, but what does count is faith (toward Christ) which works through love (toward God and man.)" Adapted from Exegetical Notes, Series B, Festival Season Sundays Gospel Texts, by Harold H. Buls, Concordia Theological Seminary Press: Ft Wayne IN, 1981, pp. 52-56. Used with permission.